For Christmas this year my mom gifted me with several books from the Voice of the Martyrs bookstore. They've been sitting in my stack of books waiting ever so patiently to be read. This past week I finally got around to reading them. Coming on the heels of reading The Bookseller of Kabul. I found this VOM books even more insightful and meaningful. 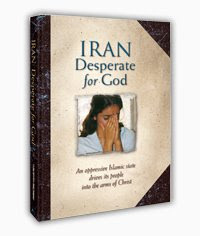 I began with Iran: Desperate for God. I should start out by saying that neither of these two books I am reviewing are particularly well-written. In fact, they aren't very well written at all. They are personal testimonies of Christians in specific countries as to their own conversion experience. The English translation is rough in spots but VOM decided to leave it as-is to stick to the individual story tellers' true meaning as much as possible. In Iran we are confronted by Islam and the rules and regulations contained therein. I learned from this book that Iran is full of nominal believers much like American is filled with nominal Christians. (Which, of course, makes sense. It's just easy to forget that with certain media reports.) So long as you do not speak out against Islam, you are free to go about your business. However, Christianity is correctly assumed to be a strong threat against belief and adherence to Islamic laws and principles. What I found most interesting is the testimony of the Christian converts that, as questioning individuals seeking truth, they were taught not to question the teaching of Islam. At all. Ever. It was not to be researched or "proven" which SHOULD lead people to believe that it's faulty. The Christian converts in this book approached the Bible with skepticism but were won over by unwavering truth. It was a very interesting read and should convince Christians not to be more vigilant against Islam but to be sympathetic to them. They can't defend their faith and they aren't allowed to question it. As a Christian, it would seem almost the better approach to lay out your Biblical facts which can't be disputed -- although some do try. 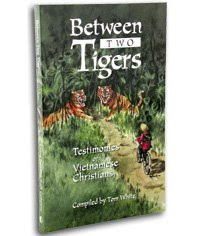 Next I moved on to Between to Tigers which relates the testimonies of Vietnamese Christians. Apparently Vietnam proclaims that it is a religiously tolerant state and that there is plenty of religious freedom to go around and then some. However, reading the testimony of these particular Christians, I would suggest that Vietnam is much like China. Yes - Christians are free to worship God so long as they do so in the government sanctioned state church which is watered down truth at best. The testimony of these Vietnamese Christians is that they wandered around lost in the state church. It wasn't until Jesus broke into their lives that they realized how deficient the state church was and desired to study and read the word of God for themselves. So long as they weren't caught (and tortured) all was well. But the government is definitely on the hunt for true believers and will persecute them when found. These books are a good reminder that we must still pray for the persecuted church. It exists and we mustn't turn a blind eye to it. I'd love for more people to read these books and check into the ministry Voice of the Martyrs. There is much to do. Reading these books is just a start and a motivation to pray. It's certainly the very least which can be done. I might look for these, although I always wonder how "embellished" testimonies like these are, published as they are to motivate a Western, mostly American, audience to pray and to become advocates for these believers. Don't get me wrong; I believe in prayer and advocacy. I just wish I were able to actually meet the subjects of these books and receive their stories from their own lips, unmediated. But I can't, so books and magazine articles are the next best thing. And I am thankful for the avenue of prayer when such stories make me feel so inadequate to help.